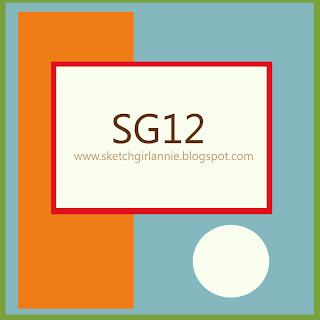 Time for a new sketch challenge at Sketch Girl. This week we were sponsored by The Wild Flower Kids. If you've never visited their store, it's a must see! We got to play with their new Royal Court digital stamps. I used patterned paper and cardstock from Papertrey Ink. Copics from DCRU. 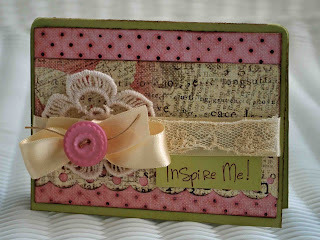 I added some vintage ribbon and lace from Etsy and Prima Bling. The Pretty Princess image was so fun to color, I just loved it! 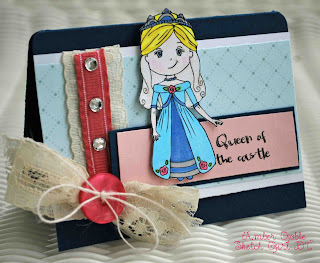 The Sketch Girl Guest Designer this month is super talented Amy Tsuruta. And the winner of Sketch Girl 13 Challenge will receive 5 digi stamps from the Wild Flower Kids! Visit Sketch Girl to upload the link to your creation! Today is the last Paper Garden Projects challenge for the month of February. 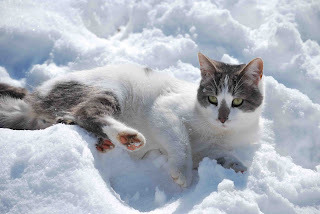 In honor of Winter's last few weeks we are challenging participants to do a "Farewell To Winter" project. Your card/LO/or Altered Project can be a Winter or Spring theme, whatever says "Goodbye Winter" to you. 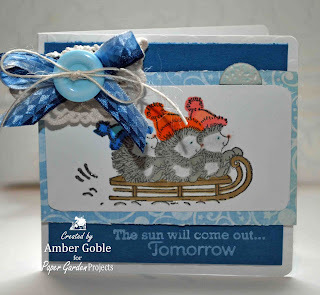 I used an adorable Penny Black Stamp Set and papers from my Frosted Winter Paper Kit, available at Paper Garden Projects Store. I also used Copics to color my stamped image. 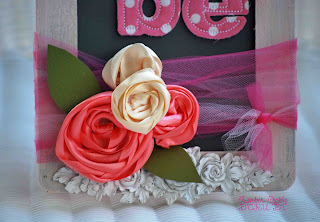 Visit Paper Garden Projects Blog to leave the link to your creation. 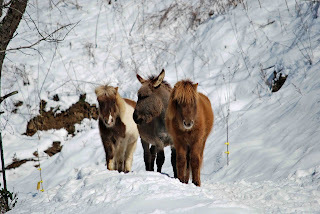 And visit the DT's Blogs to see their "Farewell To Winter". And there are some big plans in the works for Paper Garden Projects in March! A big Birthday Party, PGP is turning 2! And a DT Call is on the way! They are so fun and easy to make. All you need is ribbon, felt, and a hot glue gun. I'm sure most of you already have everything needed! Visit DCRU to see the details. Now for my project I made with these flowers. I decided to make a wall hanging. First of all I took a cheap chalkboard that I found at an antique store and decided to paint. 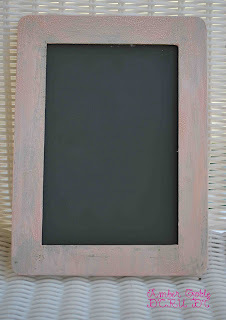 I painted the edges of my chalkboard with sage green paint then let it dry. I then painted over the green with my pink Tim Holtz crackle paint. When the paint crackled it let the green show thru and gave it a very neat distressed look. I then took a small hanger that I got from Emmas Paperie and glued it to the top of the chalkboard. Then I wrapped 2 different shades of tulle around the chalkboard. 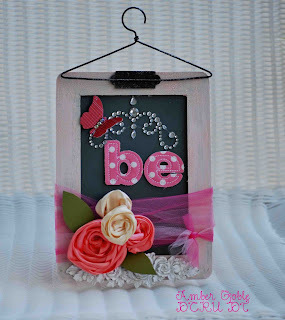 I added a Melissa Frances vintage embellishment, Prima bling & Fabric Letters. I added a Jenni Bowlin butterfly and added my flowers. I just layered them on top of eachother and made a few paper leaves and stuck around them. Easy Peasy! This card is all Papertrey Ink. I used Lolly's flower technique and loved it! 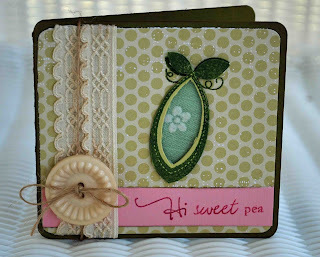 I stamped 2 pea images. The first I stamped on a piece of cardstock. I simply cut the inner part of the pea out and backed it with fabric. I then cut the second pea completely out (inside and outside) and used pop-up tape to layer it onto my first stamped image. Love how it turned out. I then layered the cardstock onto the front of my card. 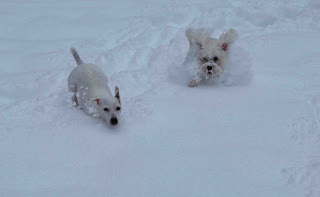 Visit ATF's Blog to see the DT's adorable LO's. Hi everyone! Who's tired of Winter, snow, and cold weather??? ME!!! 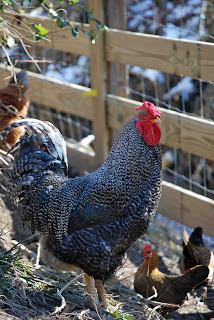 I'm ready to move on to Springy and bright projects! 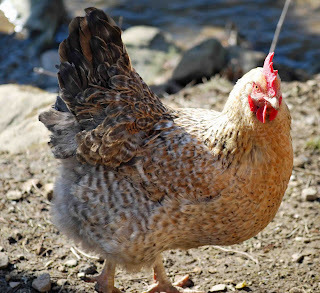 My duck has already started laying eggs and guess what!!! They're pastel green! 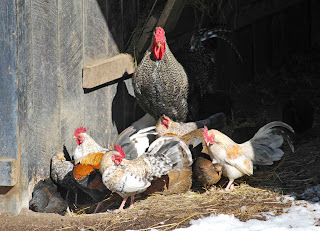 I knew chickens could lay colored eggs, but I had no idea ducks could. They are beautiful and looked like Easter Eggs! Will definitely be posting a picture of one! I bought the latest Noel Mignon kit and I'm in love with it! 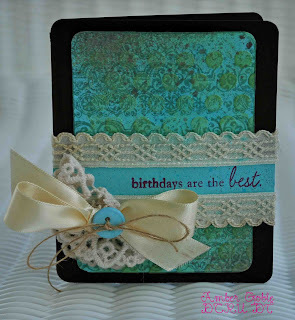 It is full of the trendiest papers, embellishments, and even pink Tim Holtz crackle paint! I want to share a few cards I made with the new kit. I'm really addicted to the shabby vintage look at the moment. I used Prism Cardstock. 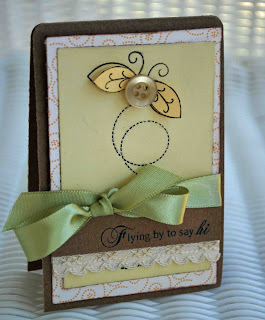 Then I took a smaller piece of light blue cardstock and used a script rub-on from 7 Gypsies to add text. I then sprayed it with Tattered Angels Glimmer Mist. My bird image is from a vintage magazine from Etsy. I touched up the picture with Copics and colored the tips of my Prima flower with the same color. For the bottom I layered lace and added a button that I glittered with glitter glue. I used a Melissa Frances Rub-On. 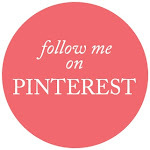 You have to check out my friend Annette's ETSY Store . She has the most beautiful Spring creations! They are just stunning. I pulled out my Prism Cardstock (available at DCRU) and got to work! I used Prism Cardstock. I took a piece of blue and stamped the design on it with Technique Tuesday stamps. 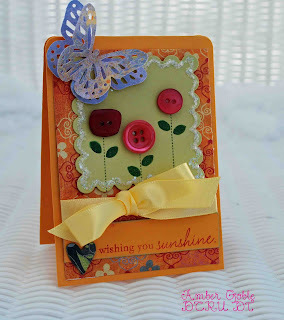 I then ran it thru my Cuttlebug using a Quickutz embossing folder. I inked my embossing with green ink to make it stand out. My ribbon is Mays Art...the easiest ribbon to use in the world. They're wide silk ribbon is the same on both sides, identical. So you don't have to worry about flipping your ribbon around trying to make the perfect bow. Everything in pink is available at the DCRU Store. Simply click on the product to start shopping. I also sprayed my embossed paper with Tattered Angels Glimmer Mist. I added a stamped sentiment, twine, and button are from PTI. My doily is SEI and the lace is from ETSY. 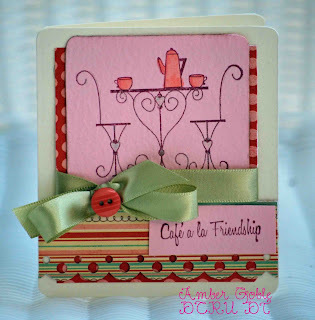 Visit the DCRU DT blog to see all the inspiring creations this week! I'm so excited to share the new Sketch Girl sketch with you today! It's so easy to create with. This week's sponsor is Sassy Studio Designs. They are providing one random participant 4 digi images of their choice! 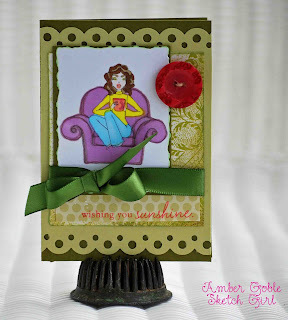 Sassy Studio Designs gave the DT 2 digi stamps to play with this week! I couldn't decide which one I liked best so I made 2 cards! 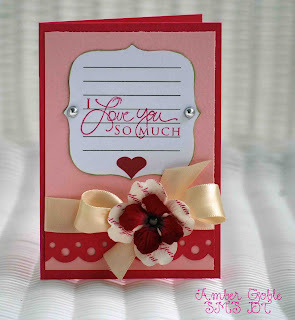 For this card I flipped the sketch around and used ribbon instead of cardstock for my rectangle. I colored my image with Copics & Crayolas : ) Then I cut it out using my Scalloped Circle Spellbinder Nestabilities. I simply used a stick pin to make the tiny holes around my image. Then I added a sentiment and a bow. I flipped the sketch for this card also. The button is the circle on the sketch. I added my digi image and added a PTI stamped sentiment. And of course I had to add ribbon and a bow. 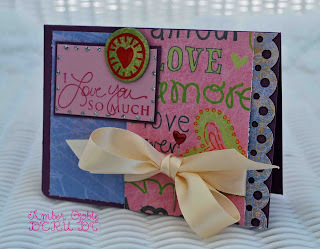 I'm loving being on the Sharing Memories Scrapbooking DT. 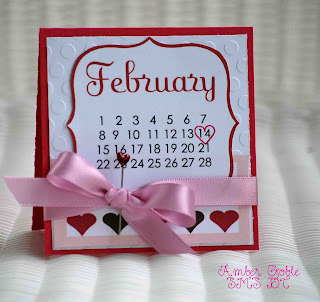 Noreen (owner of SMS) sent the DT her digital Valentine labels, calendars, and tags. They are so fun to play with and make creating so easy. 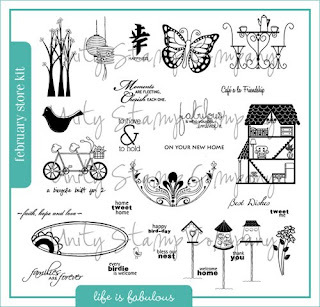 Noreen also has some free printables and page planners at the SMS website. Very helpful and fun! I'm a big fan of homemade flowers! It's just amazing that you can create something that doesn't cost a dime and looks good! I've got a few flower links for you that include video tutorials...super easy techniques than anyone can do! 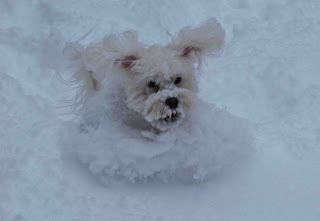 First up is my super funny friend Lolly. 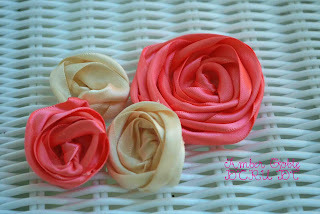 Next is Erin Bassett's fabric flower tutorial. This week DCRU's challenge is to make a "Love" project. I'm sure you've already made tons of creations with this theme! So just link them up to Mr. Linky at the DCRU DT Blog for a chance to win. I used the DCRU January Card Kit to make my project. It includes Bo Bunny Bling, Pink Paislee paper and tags, and I added a piece of May Arts Ribbon also from DCRU. I added a Making Memories Chipboard Heart (I'm so addicted to these right now, I want to put them on everything!). Check out the DCRU Blog for more inspiration from the amazing Design Team! There's a Copic Marker Super Sale going on from February 7th to the 14th at the DCRU Store Blog. If you love Copics and don't like the high prices, check it out! 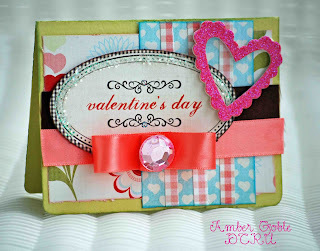 And DCRU's February Card Kit can be purchased now, it's such an adorable kit with Springy and fresh colors. First I cut a square out using my square scalloped Spellbinder Nestabilities. I then stamped the bee with PTI stamps. I then cut the big square into 4 equal smaller squares. I layered my papers, inked the edges of my paper, added a sentiment and a ribbon. And I added glitter to my button. 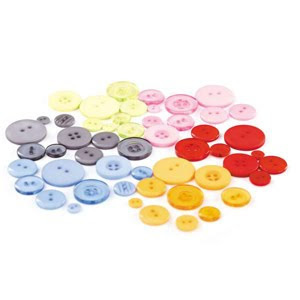 A cheap way to fancy up a button! All of my products are Papertrey Ink. It's time for a new challenge at A True Friend. 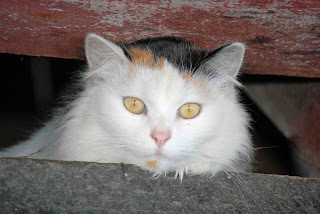 Challenge 63 is to show your pet's tricks or talent. For my LO I had to showcase Jake and his love of fetching. This is a picture of him with one of his favorite balls. He is obsessed with fetching and catching. No matter how you throw the ball he will catch it. When we have company, he thinks they are visiting to play fetch with him. Too bad dogs can't play for Major League Baseball! 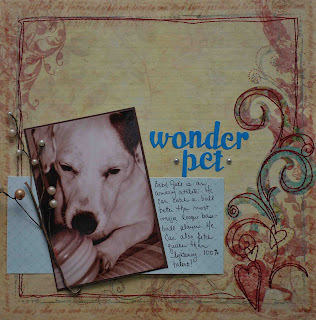 Visit A True Friend's Blog to see tons of Pet Inspiration from the Design Team! Now for happy news. 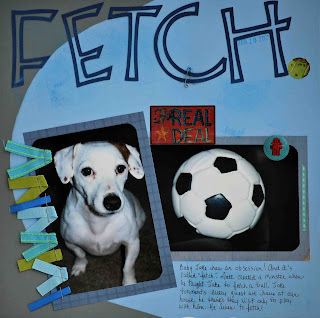 I've been invited to join the first ever Sharing Memories Scrapbooking Design Team! 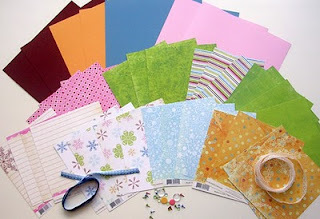 Sharing Memories Scrapbooking is a store owned by Noreen Smith who loves to share her love of crafting. And guess who's on the team with me! Sarabeth Burke my dear friend from DCRU! Visit Sharing Memories Scrapbooking to see the entire list of talented ladies that makes up the design team and visit Noreen's lovely store! Use all of the colors or just a few, the possibilities are endless! The DT got to play with Sugar Rush patterned paper and chipboard. I used Basic Grey PP and Chipboard. My Cuttlebug & Spellbinder Nestabilities. I glittered around the edges of my Square. 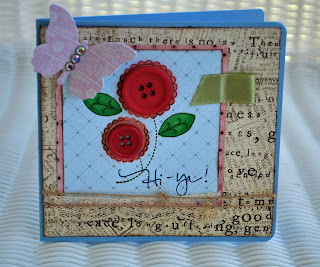 I added Papertrey Ink Stamps, Ribbon, and Buttons. I topped it off with a Butterfly made with a Martha Stewart Punch. Orange isn't a color I use often, so I had so much fun making this card. It got me out of my "pink" comfort zone. 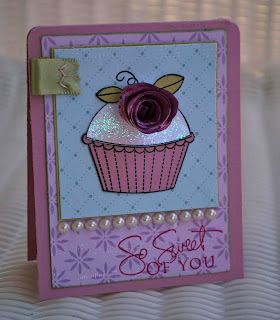 This card also uses Basic Grey Patterned Paper and Chipboard. 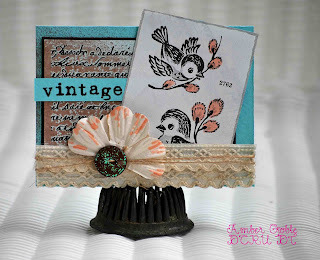 I also used my Martha Stewart Scalloped Punch and PTI Stamps. My bow was made with Mays Art Ribbon and I added a Maya Road Stick Pin. Visit the DCRU DT Blog for more inspiration! When you are snowed in, you have plenty of time to craft! 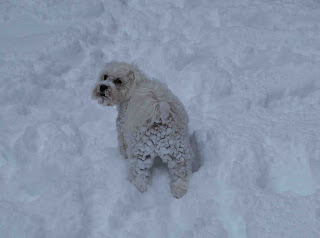 We have 8-9 inches of snow and last time Hubby looked at the thermometer it was 11 degrees! I'm ready for Spring! Have a creation to share with you tonite plus some pictures of the snowy scene around me! 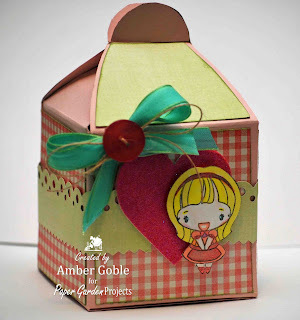 I made a muffin box using Hearts Bloom Paper Kit and a TGF Anya Stamp from Paper Garden Projects. 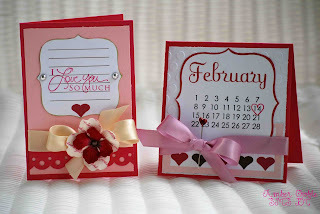 Don't forget a Hearts Bloom Paper Kit is up for grabs at PGP, see this post. I also used a Perfect Presentation Template created by Leigh Ann Baird. I used the Hey Cupcake Template available at The Wild Flower Patch. Can't wait to buy more templates to play with! I also used a Making Memories Chipboard Heart, Twine from Papertrey Ink, and Martha Stewart Scalloped Punch. Hope you've enjoyed my "picture heavy" post. Tune in tomorrow for a new DCRU challenge!